After a cold and snowy 2010-2011 winter - the snowiest in nearly 25 years (more on those events later in the countdown) - anticipation was high leading into the 2011-2012 winter on whether that trend would continue. It seems the answer came relatively quickly with the Mid-South experiencing two early-season snowfall events before winter officially began, including a very rare November snow! The first of the two events occurred on November 28. As moderate to heavy rain fell throughout the afternoon, an upper-level low pressure center developed and tracked across the Mid-South, allowing colder air aloft to work towards the surface. As this took place, rain began changing to snow during the evening and though air and ground temperatures were borderline (generally above freezing), accumulations took place on grassy areas and other non-paved surfaces. While snow amounts in the immediate Memphis area were minor (generally a half inch or less) northern and eastern areas of the metro saw more significant accumulations, with 1-2” a common occurrence and localized higher amounts. Even more significant snow fell further to the north, with up to 4-6” reported in some areas of NE Arkansas, NW Tennessee, and the Missouri Bootheel. This rare November snowfall event was the earliest of the season in nearly 20 years! Just nine days later, on December 7, as another upper level system was tracking across the region, rain again began changing to snow in the metro area during the early morning hours. As the snow persisted through rush hour, amounts began adding up, despite borderline temperatures once again an issue. By the time snow came to an end around mid-morning, 1-2” of snow lay across much of the metro, higher for most locations than seen on November 28th. 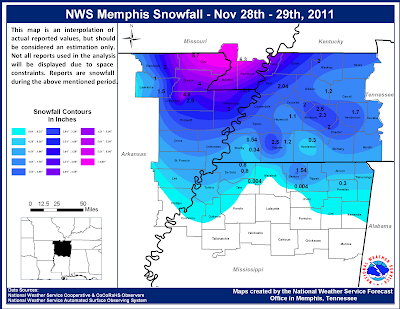 Some areas of Tipton and Fayette Counties even saw snow totals upwards of 3-4 inches! Though this system did not receive the hype of November 28th beforehand and may have surprised some, it was a very well-forecast snow event, with MWN ramping up its forecast for snow in the 24 hours prior to the event, nailing the timing of snowfall to the hour the evening before! Since these two early season events, the weather pattern in the Mid-South has transitioned into a milder one, but with such an active start, we’ll see if any events in the 2012 portion of this winter end up making next year’s list! Back in the late winter of 2011, when our only mobile technology was a mobile version of the website, I saw a need for having dedicated "apps" for iPhone and Android if we were to continue to evolve and grow (in part thanks to demand from you, our customer!). Enter Ben Deming, who was also mentioned in yesterday's post at #9. Ben and I quickly hit it off and created a win-win scenario whereby MWN's dedicated following is the ultimate winner! In early March, version 1.0 of the MWN iPhone app hit the market. Just one short month later, Ben was able to crank out the Android app and MWN had the majority of the smartphone market covered with a dedicated app. Features included current conditions, StormView Radar, MWN Forecast, Mid-South weather alerts map, various links, and the MWN Twitter feed. Shortly after the app was released, I decided to take it a step further. Why not provide alerts to app users if they were in the path of the storm? I knew if implemented correctly that it could be a hit, mainly because people are siren-weary and frequently don't know where they are relative to the warning. Show them where they are, where the warning is, and alert them only if they are in the warning box. 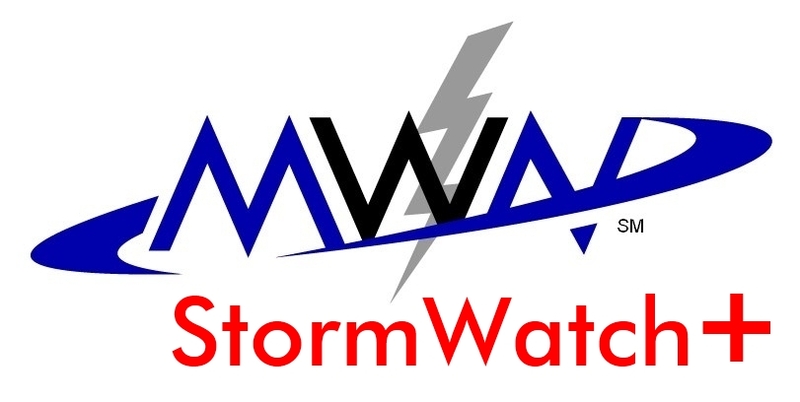 Enter StormWatch+ and the proclamation by the NWS that mobile alerting technology is part of the future of severe weather alert dissemination. After much testing and tweaking, the iPhone version of StormWatch+ was sent to Apple in mid-September. A well-documented 3 1/2 months later and we're still waiting on it's final approval by Apple to be released to you. The Android version was released in mid-November. Our plans for 2012 include a web-based interface that will allow those without smartphones to receive text messages or e-mail alerts of severe weather just as smartphone users receive push notifications. The key is to only alert people if they are in harm's way. We hope that this technology will go a long way towards reducing the apathy that the public has towards the severe weather warning process and ultimately save lives. Tomorrow we reveal #'s 5 and 6 of the top 11 Mid-South weather events of 2011. For our Twitter followers, a couple of #memstorm events are up next! Stay tuned!